The lively CHAI Living building (Shanghai, China), one of the nerve centres for informative meetings of the world of design and construction in the city, was the place selected by PORCELANOSA Shanghai for presenting the technological advance of the new solid surface KRION K-LIFE to over 170 architects and designers. 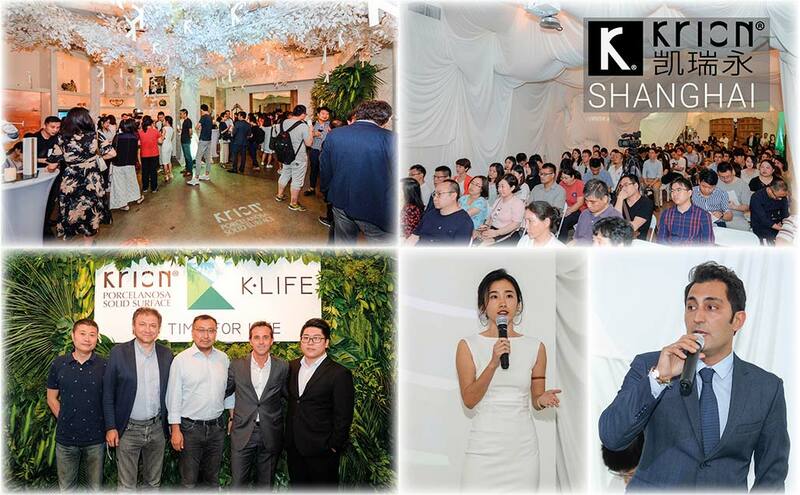 Some of the renowned studios (GMP, Ecadi, Woods Bagot, Aedas and Kokai Studio) present along with a multitude of design and construction professionals, discovered the advantages of KRION and K-LIFE in a pleasant and informative presentation. As a summary of these advantages which help to improve our quality of life, K-LIFE and its KEAST Eco-Active Solid Technology® expands upon the renowned properties of the material with air purification, improved anti-bacterial effect, elimination of chemical products and easy-cleaning. For the event, the room was decorated with a white tree representing a prosperous future, in which K-LIFE and the new materials becoming the solution to environmental damage, along with a space covered in white for the occasion on which the company Caamaño Asia carried out examples of backlighting applications, amazing designs and customised signage with KRION.